Cells are composed of organelles and other cell compartments that work together during normal cell function. In multicellular organisms, cells join together to form tissues. These web pages deal with how tissues are organized to form organs in animals. Animals have a variety of organs and each one develops particular functions. When comparing an animal with a cell, it can be observed the division of work in specialized compartments, but at different scale. In eukaryotic cell, these compartments are mostly organelles, whereas in animals the compartments are organs and systems. Some of the organs and systems of animals. ♦ Nervous system: central and peripheral. ♦ Integument: skin and derivatives. ♦ Cardiovascular system: blood vessels and heart. ♦ Lymphatic system: vessels and lymphoid structures. ♦ Reproductive system: gonads and associated glands. 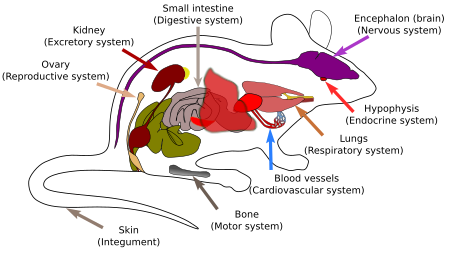 ♦ Digestive system: digestive ducts and associated glands. ♦ Excretory system: kidneys and excretory ducts. excretores. ♦ Endocrine system: glands and organs.